Eleventh month. Eleventh day. Eleventh hour. One hundred years ago, on November 11, 1918, World War I ended. The eleventh month and eleventh day is now Veterans Day. A day to honor generations of heroes who have worn our country’s uniform and helped preserve the freedoms and way of life we enjoy today. Giving blood is one of the most meaningful and lasting ways to salute their service. 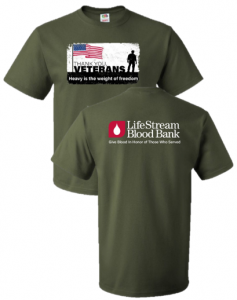 Donate blood at a LifeStream donor center or participating mobile drives Friday, Nov. 9; Saturday, Nov. 10; Veterans Day, Sunday, Nov. 11 or Monday, Nov. 12 and receive a special edition Veterans Day T-shirt. Show your heart of appreciation. Thank you, veterans. Thank you, blood donors.